Experienced managers will quickly note another business school concept known interchangeably as the "first mover disadvantage" or the "second mover advantage." Many companies have achieved a dominant market position not by being first to market, but by improving upon earlier but lower quality entrants. Apple, for example, launched the iPod and nearly overnight eliminated dozens of weaker competitors in the portable MP3 digital music category. It then did the same with the iPad to achieve dominance in the tablet PC category. This is the same Apple that first offered a personal desktop computer and a graphical user interface, neither of which helped the company escape a market position that was a mere rounding error to Wintel machines' market share for over 20 years. Apple is rightfully lauded for its innovation, but in not all cases has it been first to market. First movers sometimes invest huge sums of capital to create a new category, only to watch later entrants incorporate newer technology or processes and achieve a better market position and better profits. Racing aficionados know this as drafting, the technique of sliding behind a competitor to reduce wind resistance. My comment about the race to be second was a reference to law firms' tendency to risk aversion, not lauding them for cleverly waiting to embrace a second mover advantage. In some markets, it's only clear after the fact whether it was smarter to have moved first or to have waited until others paved the way. But in today's evolving market, law firm leaders' reluctance to embrace legal project management, alternative fee arrangements, continuous improvement, client satisfaction programs and sophisticated business development programs are examples of law firms purposely lagging so as not to be too ahead of the market, in many cases because the lawyer-leaders hope for a return to normalcy that will eliminate the need for hasty and disruptive changes. 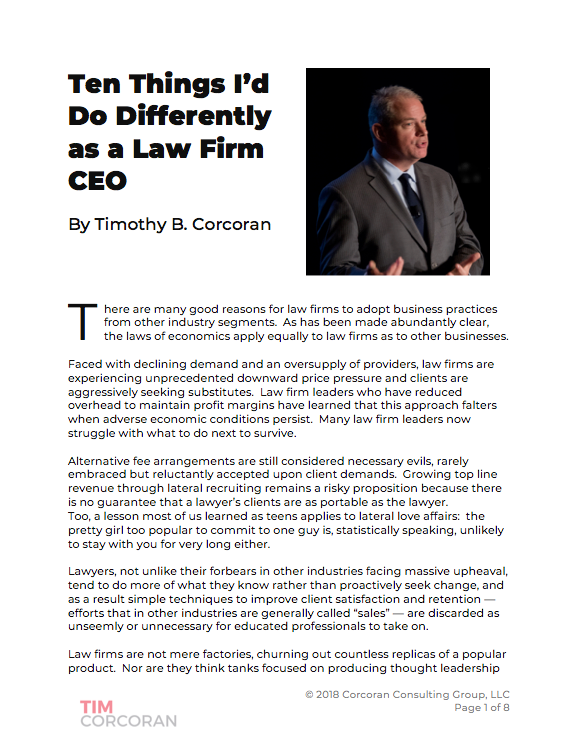 The message could not be clearer: law firms that lag in adapting to the new normal will have a significant competitive disadvantage. The appearance of Legal Process Outsourcing (LPO) providers is just one example of law firm clients seeking an alternative when the usual supplier, the typical large law firm, is unwilling or unable to adapt with sufficient speed. The reluctance to invest and adapt is, at times, more than mere risk aversion, it's a deep-seated belief in precedent. Lawyers who lead firms are trained in the importance of precedent, and absent a clear demonstration of a new business model working effectively in a firm much like their own, these leaders are content to take a wait-and-see approach. Or they dismiss the notion of change as unnecessary, as Bruce MacEwen in his recent interview with an LPO executive suggests, "Firms (not all, but the vast majority) will point out that their model has worked brilliantly for a century and will be comfortable dismissing the threat; analysis will stop right there." What is tomorrow's leading law firm? Will it look like the successful law firm of today? Will it even be characterized as a law firm, in the traditional meaning of the phrase, or is it more likely to be a business providing exceptional legal services to clients who are, not surprisingly, less concerned with protecting the legal guild and more concerned with their own productivity and profits? No one can say with certainty. But for those lawyers with a competitive streak, weary of sitting on the sidelines and allowing others to dictate the future of legal services delivery, perhaps it's helpful to heed the words of Ricky Bobby, "If you're not first, you're last."